A new breakthrough in the chemistry of hair care has emerged. Olaplex is rumored to protect the hair from the damaging chemical reactions of hair color and other permanent services. Before your eyebrow flares up, let's take a closer look. Hair fibers, which can be very strong, are easily compromised by our use of styling aids and everyday wear and tear. To alter the state of our hair requires manipulating particular bonds within our hair shaft. Two of the bonds rearrange temporarily and then can form back together again. The salt bonds can break within the hair based on pH levels and when the appropriate pH level is neutralized, they come back together. Hydrogen bonds are very weak and can be broken with water or heat. After cooling, the bonds will return to their natural state. The disulfide bonds or cysteine bonds, and peptide bonds are considered chemical bonds and cannot be easily broken. However, chemical treatments can permanently break down these bonds. And since bonds cannot repair themselves, the hair gurus on high have taught us to condition regularly to prevent further damage. However, we have also been taught that there is nothing you can do to repair broken bonds…at least until Olaplex entered the building. Add Olaplex Bond Multiplier No. 1 into your color or lightener before applying to the hair. After color is rinsed, apply Perfector No. 2 to eliminate breakage with every hair service. Then rinse, shampoo, and condition. Perfector No.3 is a take home solution for the client to use once a week to further strengthen the hair or to be used as a pre-treatment of a future chemical or thermal service. Mix 1/2 oz (15ml) of No.1 Bond Multiplier with 3oz (90ml) of water in an applicator bottle. Apply from roots to ends. Saturate hair and comb through. Leave on for five or more minutes. Without rinsing, apply a generous amount of No.2 Bond Perfector and comb through once. Leave on for a minimum of ten minutes. 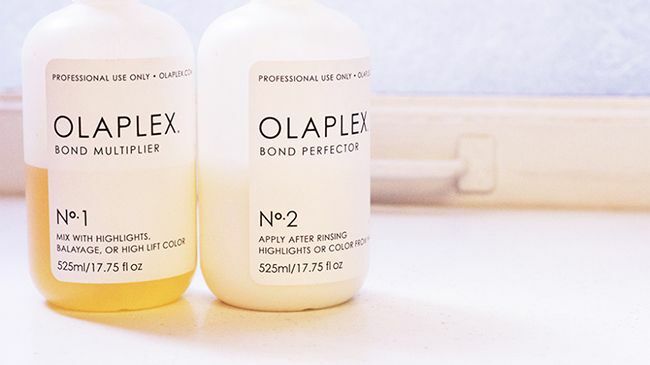 It is important to note that Olaplex treats the internal structure of the hair, therefore the final shampoo and condition is necessary to treat the external hair shaft. What can Olaplex do for me? As curly women, we often have dry, fragile hair, which can scare you away from daring color selections and heat styling. Olaplex could provide the buffer between you and styling damage, allowing you to push the envelope like you have always envisioned. If your hair is already damaged, you can apply Olaplex as a deep penetrating treatment to finally repair broken bonds within your hair strands rather than temporarily patch them up. Master Stylist and Owner of Neal Parker Salon in Abilene, TX Neal Parker says, “We love it! We have seen nothing but good results and it really upholds the integrity of the hair. Of course always use caution. There is no magic, but it is legitimately different than other products. The results are insanely noticeable and curly damaged hair gets more of its curl back!" On that note, which of you will give this new revolutionary treatment a try?